Buzzer beaters, touchdowns, spikes and saves. Who says playing sports in college should exclude the average student? Georgia State’s intramurals allow anyone with a passion for competition to take a break from their studies and play in organized sports leagues. Signing up is easy, and leagues are active the entire school year. Intramurals are geared toward competition between students at Georgia State, as opposed to club sports, which pit Georgia State teams against other colleges at the state, regional or national level. Intramurals organize games and tournaments; however, they don’t arrange practice times or spaces for teams – that’s up to the students. Intramurals are also free to participate in, whereas club sports may have membership fees. Club sports may qualify for financial assistance from the Recreation Center based on a four-tier system that determines how much funding teams can receive. Tier one clubs, such as rowing, can get up to $5,000, tier two up to $1,000 and tiers three and four receive no funding. Granted amounts also depend on the number of teams that qualify and the total amount of available funds. Club sports team can climb to higher tiers by earning points through three different categories: leadership, form completion and competition. All current Georgia State students, alumni, staff and faculty can participate in intramural competition. The spouses of Georgia State faculty can also participate if they are active members of the Recreation Center. Varsity athletes are eligible to play sports that are similar or the same as their sport. For example, football players can play flag football, tennis players can play racquet sports and so on. Perimeter students can participate as well, but only two are allowed on each Downtown Atlanta campus team. Schneider came up with an All-Georgia State tournament for flag football and 5-on-5 basketball. 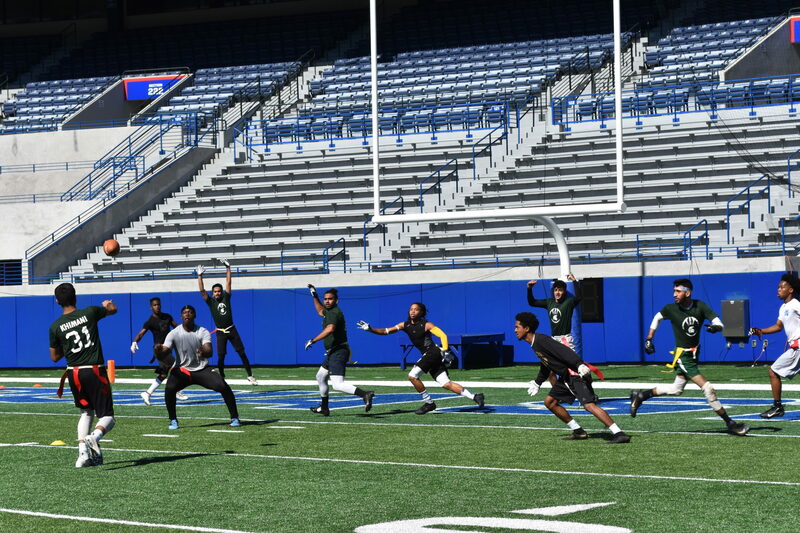 The Downtown Atlanta and Perimeter campuses competed on Sunday, Oct. 28 for the flag football tournament. Pi Kappa Phi defeated the Alphas 26-7 in the championship game. This is the third consecutive year a Downtown Atlanta campus team has won the flag football trophy. Phase II of fall intramural sports began Oct. 27 with dodgeball. Phase I, which included sports like flag football and indoor soccer, ended mid-October, and its playoffs ran from the Oct. 11 through Oct. 18. Students can register for Phase II online through IMLeagues, the site where people can access intramural schedules, rosters and sign up sheets. Anyone with a Georgia State email address can access the university’s page, create a team, join a team or sign up as a free agent. Any person who creates a team is considered the captain. Team captains are responsible for organizing and contacting members of the team and informing them of the sport rules and policies. Students can sign up as free agents if they don’t have a team yet. Teams will sign free agents if they need extra players on their roster. Free agents can also send a request to join a team that must be approved by the team’s captain. Intramural tournament champions receive T-shirts and a trophy at the end of the season. In addition, the champions for major sports are offered a chance to compete in “extramural events,” or competitions between intramural teams of different schools. Georgia State covers extramural tournament registration costs for champions. This year’s flag football champion was offered a trip to the Georgia Peach Classic extramural tournament that Georgia Southern will host from Nov. 16-18..
Greeks have their own divisions of intramurals: the National Panhellenic Conference and the Interfraternity Council. Phi Mu has won the last five NPC championships and a Jernigan Cup in 2016. The Frank B. Jernigan Intramural All-Star Award, or the Jernigan Cup, is an award named after the first director of recreational services at Georgia State. Schneider said that the Jernigan cup “awards the best overall teams for the entire academic season who participate in major and minor events.” Teams compete in as many sports as possible to earn points. Points are gained through participation, sportsmanship and success in either major or minor events. Major sports, such as flag football, 5-on-5 basketball, softball and indoor volleyball receive more points than minor sports like sand volleyball, 3-on-3 basketball and arena ultimate frisbee. Esports are new to the intramurals scene, having just began last year. Few people have played the esport intramurals so far, but the Recreation Center will continue to offer them because the games don’t require officials or other costs. Some students, like Georgia State senior Teddy Werner, hope that esports will grow in the future. Werner has played in intramurals for the past four years. Awareness may be a hurdle to overcome in the introduction of these new options.